Calvin and Hobbes was the comic of my childhood; there is no competition. I got my hands on every collection I could find, from Scientific Progress Goes “Boink” to Attack of the Deranged Mutant Killer Monster Snow Goons (which my beagle, perhaps annoyed at my lack of devotion to Snoopy, chewed up at the first opportunity). 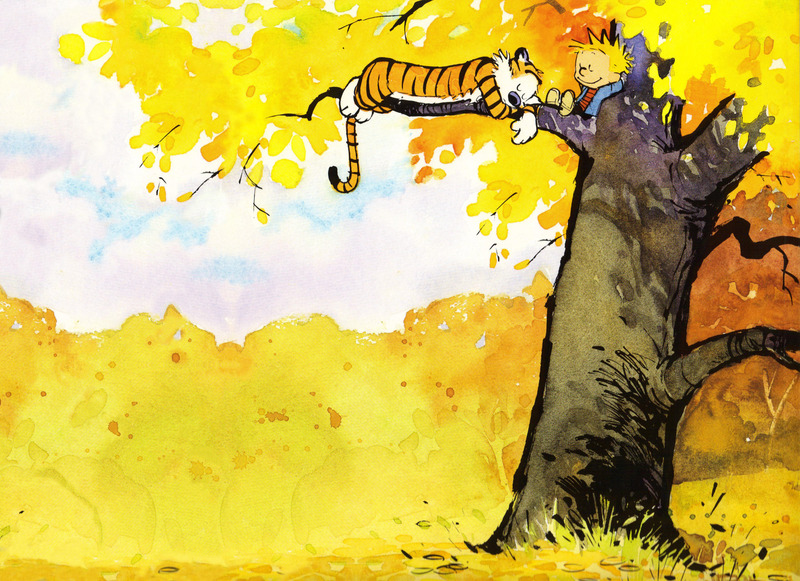 As a child, Calvin’s wild imagination was an inspiration; I could get lost in it for hours and it was something I aspired to in my own games, especially with fellow fans. As an adult, I’m amazed at how the comic speaks so directly to both 6-year-olds and 28-year-olds, and everyone between and beyond. I am also amazed at the care Watterson took in painting his sprawling, colorful landscapes that served no functional purpose beyond being the background to some philosophical musings of the titular characters. He is a true craftsman, a cartoonist for the ages. His devotion to craftsmanship is so strong that it would be all too easy to read him as anti-commerce and anti-business when it comes to the influence those things on the art of comics. Most famously, he is very anti-licensing, and as a result we have had no Calvin and Hobbes cartoons, or Spaceman Spiff backpacks. Nevertheless, I think there is more to his position, as I understand it, than this simplified story. I think that even if we cannot reconcile him with the notion that commerce is beautiful, we can nevertheless find in his arguments a version of the bourgeois virtues. My point of reference is his 1989 speech at the Festival of Cartoon Art, “The Cheapening of Comics”. 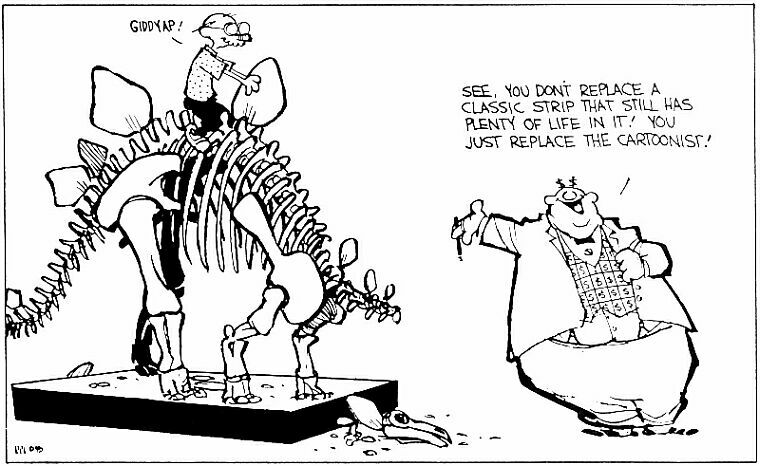 I realize I may be critiquing a 1989 version of Watterson which the man alive today may well have moved on from. In fact, I am excited by the upcoming documentary on the state of comics that he will be participating in, precisely because I can’t wait to see how his views have evolved. Nevertheless, I found the speech so interesting that I can’t help myself, I must comment on it. Peanuts is about the search for acceptance, security, and love, and how hard those self-affirming things are to find. The strip is also about alienation, about ambition, about heroes, about religion, and about the search for meaning and “happiness” in life. For a comic strip, it digs pretty deep. The strip constantly plays with its own form, and becomes a sort of essay on cartoon existentialism. The background scenery changes from panel to panel, and day can turn to night and back again during a brief conversation. I do not buy this argument, for the simple reason that Watterson himself was at this point squarely in the middle of Calvin and Hobbes’ phenomenal run! Like all “golden age gone by” arguments, there is a huge survivorship bias in comparing the few from the past that have survived to the present, to the many that are alive today. Watterson thinks that comics like Peanuts must have hit the comic reading community like a bombshell when they first arrived, but it is much more likely that it was simply one among many, and its greatness was not appreciated until later. Couple Sturgeon’s Law with survivorship bias and you’ll see why these types of arguments always sound persuasive no matter what era you happen to be living in. Nevertheless, Watterson’s main argument is much deeper than reminiscing about the good old days. Watterson is frustrated by the state of the comics business, and its influence on the work that is getting done. I would summarize his point of view in the form of three arguments: first, the comics industry today is not euvoluntary. Second, at present, the sacred is being entirely sacrificed to the profane. Finally, comic artists and their business partners can do better, and should. 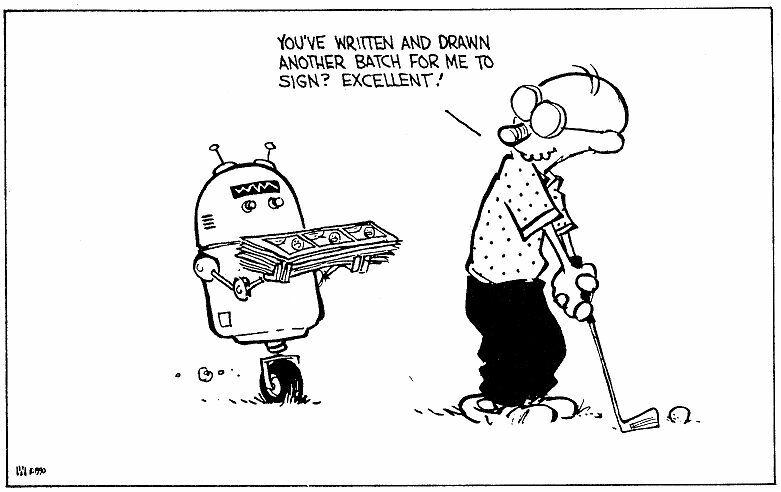 Watterson argues that syndicates take advantage of aspiring cartoonists in a number of ways. The original, and cardinal sin is demanding that the cartoonist sign over all the rights to their creation up front. This preemptively takes away any leverage that the creator might have should their creation ever take off in popularity. If the creator doesn’t want to license their work, or doesn’t want to let business considerations change the direction of the strip, they can simply be replaced. 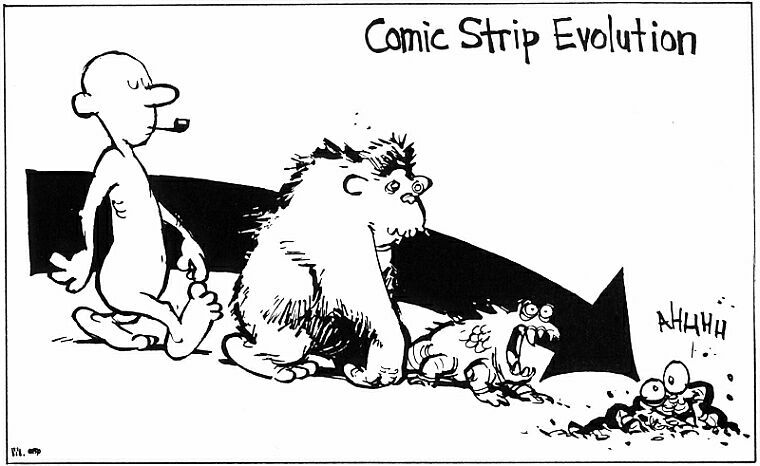 Watterson also notes the shrinking number of newspapers, and the shrinking amount of space that they provided for comics, as compounding factors. But this also illustrates the risks and costs faced by syndicates, who did the hard work to lower transaction costs to proliferating a comic across newspapers at a time when such costs were prohibitive. A brand new comic strip faced very low odds of success at the outset, and any space it took up was space that another comic, which may have actually succeeded, could be taking up. In order for the expected return of any one comic to break even, the artists had to offer up the option value of ownership. It need not be that way, however, as Watterson points out: the book industry offers far less onerous terms to new authors. Now, can you imagine a novelist giving his literary agent the ownership of his characters and all reprint, television, and movie rights before the agent takes the manuscript to a publisher? 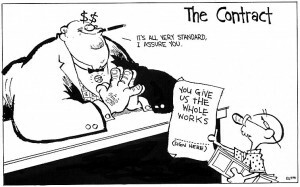 Obviously, an author would have to be a raving lunatic to agree to such a deal, but virtually every cartoonist does exactly that when a syndicate demands ownership before agreeing to sell the strip to newspapers. This is interesting, given that the BATNAs here should be similar—but perhaps they are simply not perceived as such by the respective creators in each industry. From this perspective part of Watterson’s argument could be seen as a plea for creators to take their alternatives more seriously when coming to the bargaining table. And indeed, this is the major thrust of his argument, as we will see further down. Note the implication that business interests do not have to undermine the concerns of art, just that they are at present, and perhaps did not do so in the past (during his golden era of Peanuts, Pogo, and Krazy Kat). I read the “rocky marriage” of business and art as a nod to the reality of trade-offs. Sometimes a balance is struck in which great art is promoted in a profitable manner. Sometimes a balance is struck where profitable strategies are arrived at which sacrifice too much artistic integrity. And sometimes the balance of the moment is neither very profitable nor very artistic, though this balance cannot last forever. It’s getting stuck in the second balance that Watterson is afraid of. There are several ways in which the profane has intruded upon the sacred in Watterson’s worldview. The first goes back to the ownership problem; syndicates have ultimate creative control. When they say jump, if the creator does not say “how high?” on cue, they can be replaced at a moment’s notice by someone from the sea of unemployed cartoonists out there. The second debasement comes from merchandise licensing, which Watterson is so famous for abstaining from. 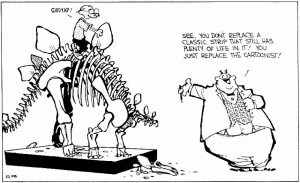 The final sin is a variation of the first, but perpetuated by cartoonists rather than by syndicates. It is hinted at in the passage above with the mention of “extra assistants” and “having so many cooks in the kitchen”; the established cartoonist hires assistants to produce his work for him, and merely signs his name on it once it is ready to go to print. All of these dynamics have grown exponentially since 1989. The replaceable nature of specific creators in a franchise has been honed and perfected; turning a successful creation in one medium into every other medium conceivable has as well. And the James Pattersons are famously accused of being in a coma somewhere while a staff of ghost writers continue producing books using the highly predictable formula the actual author made his name using. I want to push back here for a moment. 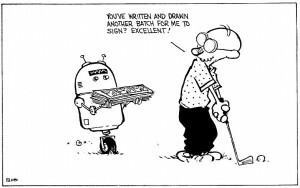 I am very sympathetic to the points that Watterson makes but I happen to think that the sacred and the profane work together here in more subtle ways than he allows. There is a role for immortal business-owned franchises as well as mortal creator-owned characters. Licensing can and often does coexist with legitimate creative vision and execution. I’ll admit that there’s something fundamentally dishonest about ghostwriting, but the more charitable take is that some “creators” become a brand name for a certain quality of product, making it possible for audiences to gain a degree of predictability in finding something they know they like that would otherwise be lacking. Moreover, there is sacredness here, for creators working their way up in the world. Just as fanfiction writers today hone their writing by borrowing other creators’ characters and worlds, so too do professional writers working for Marvel or DC comics get to hone their writing—and get paid for the trouble—by writing storylines for cherished classic characters. Given Watterson’s feelings about the potential for art in comics involving elementary school angst and goofy alley cats, he displays a remarkable snobbery towards comic books, making an offhanded reference to “miserably done super-hero comics.” But it is clear to children who grew up reading such comics that the spark of the divine can be found here, as well. You can see it in an interview with Joss Whedon getting choked up talking about his pitch for a Batman movie that got rejected—people invest a lot of feeling into these franchises, and as creators they want to make their mark. 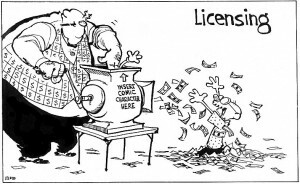 I also reject Watterson’s special concern for licensing as a source of corruption, as it implies art is only pure when there are no external influences on the creator. He asks us how we can trust that a creator’s characters are saying what they say because of values internal to the creation rather than because it will sell well on a coffee mug, but this is all too convenient a stopping place. How do we know that Calvin said what he said because it worked well with an artistic vision rather than because Watterson didn’t want to make it marketable? This is no reductio ad absurdum—Brian K. Vaughan specifically chose the opening words for the excellent comic Saga in order to dissuade agents from thinking about optioning it for a film. And it doesn’t detract from Saga’s greatness at all—nor does Charlie Brown appearing on MetLife commercials detract from the greatness of Peanuts. Art, like virtue, is a balancing act—you must balance internal considerations for what you desire to accomplish with the plot, how you want your characters to develop, what sort of visual impacts you want to create, and so on. These are as much a “rocky marriage” as the marriage between them and more external considerations—who your implied audience is, whether there are enough such people to pay your bills, and if so, whether your agent or the syndicate or a publisher can be persuaded as such. To name but a few. Art is the balance that is struck across all of these factors, not just the internal ones. Sometimes this means taking the Austin Kleon approach (or the one I recommend here) and keeping a day job unrelated to your art, so that what you actually create focuses primarily on striking the internal balance. That is ultimately where Watterson ended up, after he left the public limelight at the end of Calvin and Hobbes’ run. Often, though, the things we think of as truly great were created by striking the best balance creators were capable of out in the marketplace—in partnership with the many merchants and middlemen who operate in that space. If we judge this process by the average quality of its output, for a sufficiently high standard of quality, we risk falling into the same Sturgeon’s law plus survivorship bias trap that Watterson did. Of course most art created in the market is mediocre. Most art is mediocre, period. But the aspirational ethic of the craftsman can and does persist and thrive in an atmosphere of beautiful commerce. Nevertheless, no morally serious conversation around creators and creations should ignore the ultimate aim of Watterson’s speech. But suppose someone published a quality cartoon magazine. Imagine full-color, big comics in a lush, glossy format. Why not? This was already an established practice—though usually not full-color, at least not for every issue—in Japan. The culture of comics and animation in Japan has been different from America’s for a long time, in ways that Watterson would approve of. For instance, they do not consider comics to be primarily a children’s medium. My point is simply that cartoons are not necessarily doomed to increasing stupidity and crude craftsmanship. With the right publishing, comics can move into whole new worlds we’ve never seen. Moreover, I think any effort to improve the quality of comics would very likely be rewarded in the marketplace. Think of the people who cut out certain comics to put on refrigerators, or to put in scrapbooks, or to send in letters, or to stick on their office walls. Give them a nicely printed, big color comic on good paper and see if they don’t jump. I think the public would respond if there was a publisher out there with an ounce of vision. For too long, syndicates and cartoonists have been congratulating themselves whenever things don’t get worse. I don’t think that’s good enough. This very weekend we’ve got syndicate executives, cartoonists, readers, and newspaper people all together. let’s knock some heads together and see what we can do. Let’s ask people what they’re doing to improve the state of comics. Folks, if Deirdre McCloskey is right, this is the attitude that lifted hundreds of millions of people out of the subsistence farming of their ancestors. This is the vision of a better future, the willingness to imagine that circumstances are not fixed. This is the living and breathing bourgeois virtues, still with us and still very important. 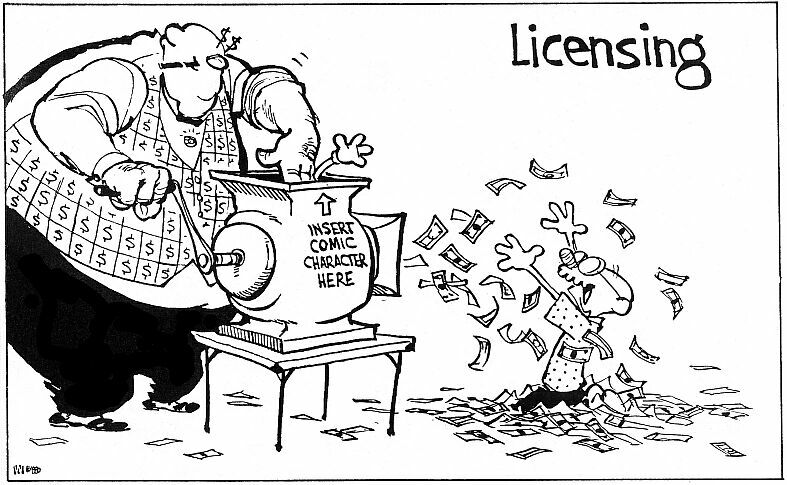 And Watterson was not just talk—he walked the walk where licensing was concerned. And he fought for every square inch of Sunday comics he could get in order to be able to do his beautiful, sprawling landscapes despite the huge premium on space. The comic industry has not stood still since 1989, as I’m sure the upcoming documentary Watterson is a part of will discuss. Creator-owned brands like Image have popped up. Webcomics have provided a new option for the creator who wants at least one project where they needn’t take into consideration marketability. Things like Humble Bundle and ComiXology and Paypal make it easier for creators to sell their creations to an audience directly, and Kickstarter makes it possible to get per-project funding up front. These things all came about from a combination of prudent business dealing and aspirations for building a better world. I see “The Cheapening of Comics” as a prime example of how important McCloskey’s project is of reviving a morally serious conversation about the morality of bourgeois life. The bourgeois virtues are all in there, they are, but they’re stuck in the anti-commercial narratives that we’ve all been fed by the writerly class since the middle of the 19th century. It’s time to move on. Let’s begin again with a conversation on the marriage of artistic aspirations and beautiful commerce.